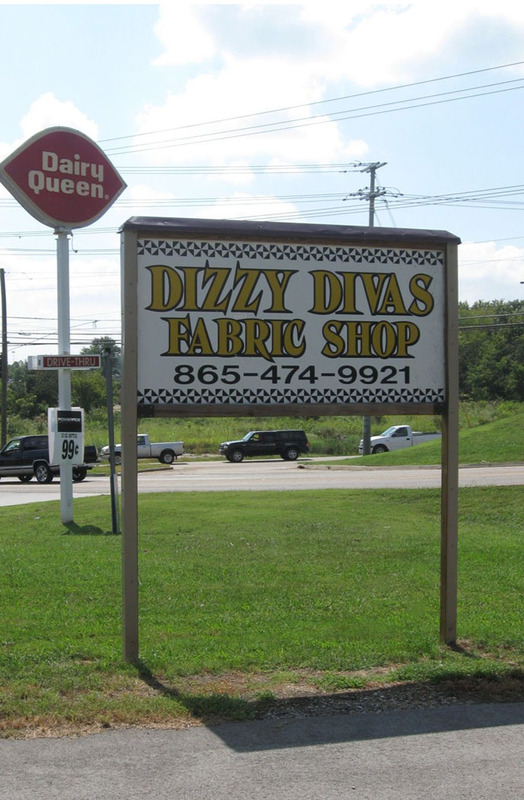 Off the I-640 loop on the northeast side of Knoxville is the Dizzy Divas Fabric Shop. 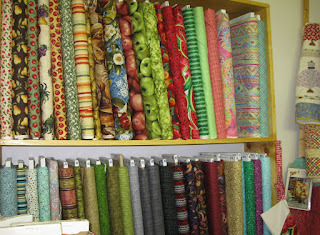 "Busy" they are... with several WIPs (works-in-progress) on the classroom design wall. "Dizzy?" 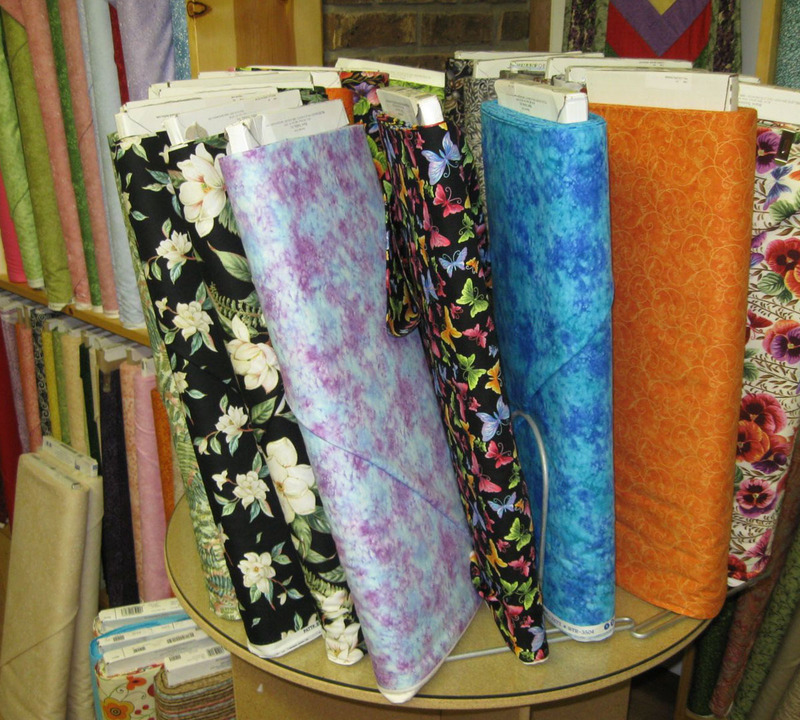 maybe or maybe not... but they do have like to have fun in the shop with their quilting, sewing, fabrics and classes. Colorful lap quilts hang from a clothesline inside the Dizzy Divas Fabric Shop. 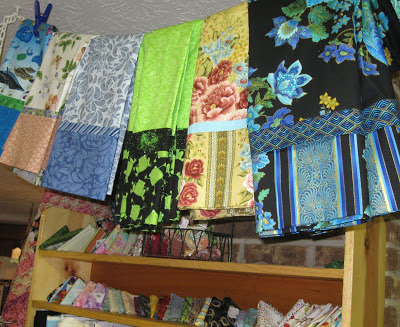 Wanda McCarter, the shop's owner, opened Dizzy Divas Fabric Shop about 3 years ago in December to serve quilting and sewing enthusiasts in the area. Dizzy Divas Fabric Shop, Knoxville, Tennessee. 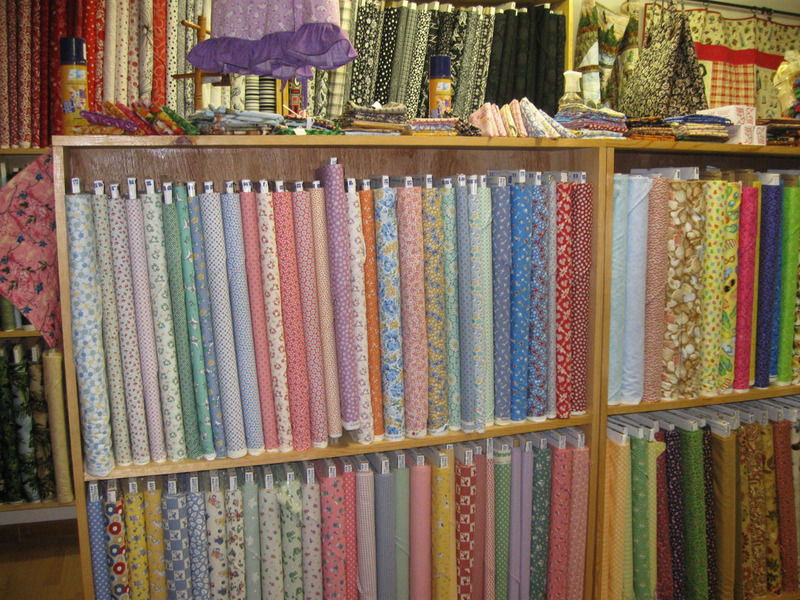 Every room in the shop (a house with a split-level floor plan) is filled with fabrics, patterns, notions and books. 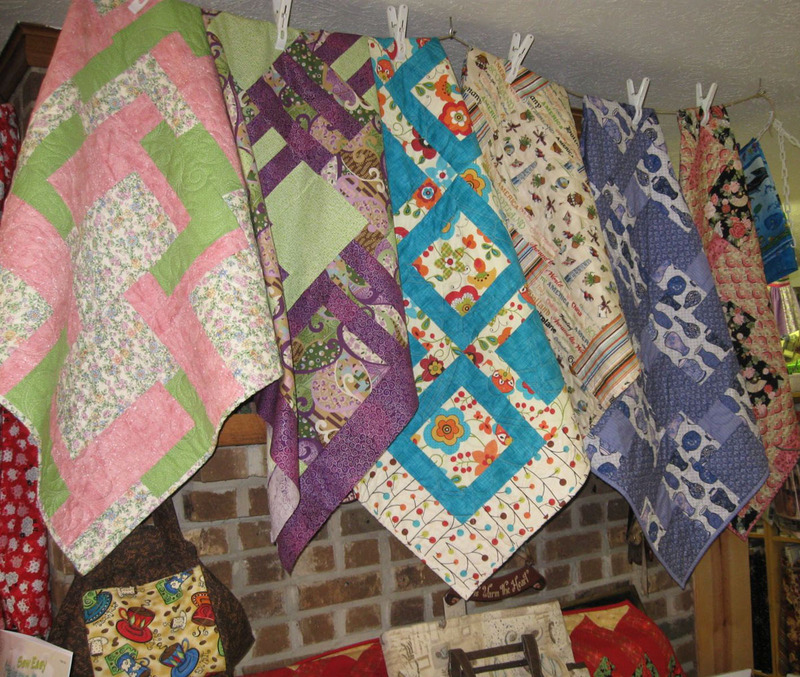 Samples of quilts, tote bags, and other sewing projects hang on the walls and from the ceiling. 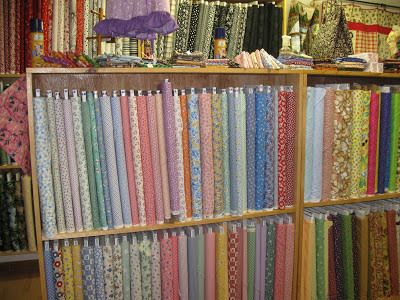 Walls and shelves of fabrics at Dizzy Divas. Shelves with 20s and 30s prints. Patterns for a variety of projects. Fruit novelties, stripes and blenders. 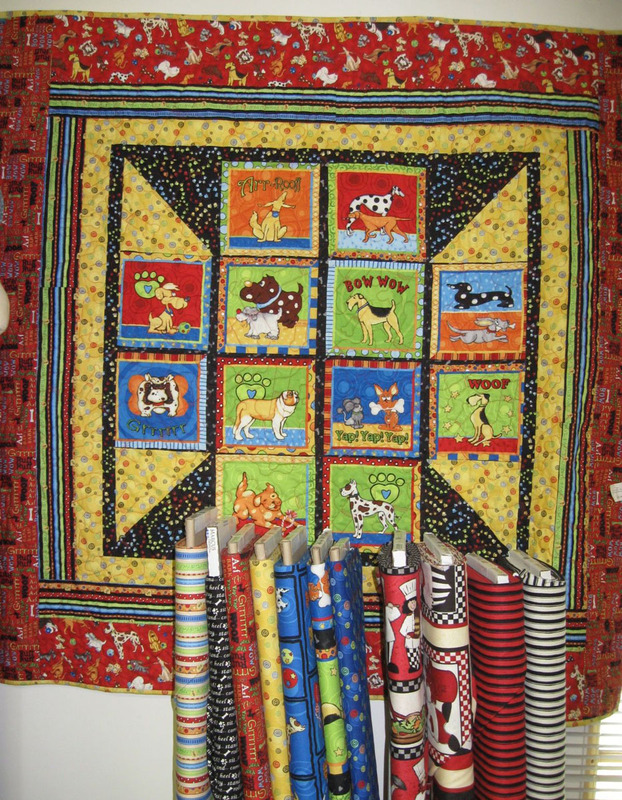 like these dog prints and coordinates found in this cute wall quilt. 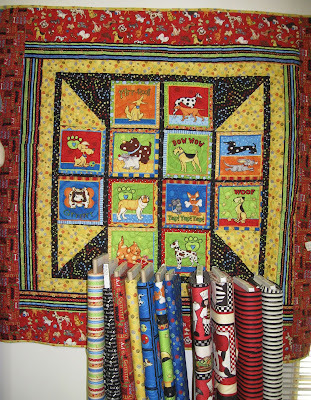 Wall hanging made of dog-themed novelty prints. 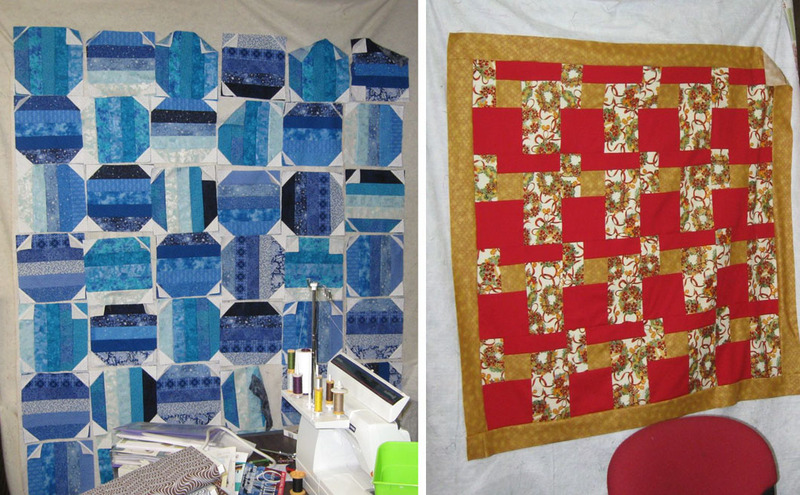 These 2- and 3-fabric projects showcase Positively Poppies, Magnolia and Counting Sheep fabric collections from Blank Quilting. 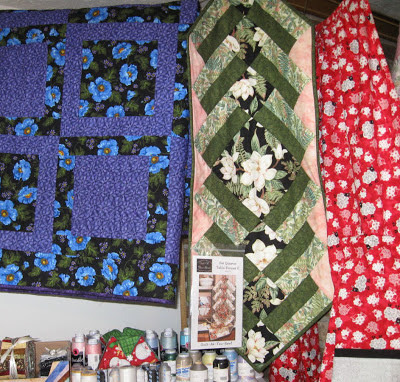 Fast and fun quilted projects include lap quilts and table runners. Up a few stairs is the classroom. 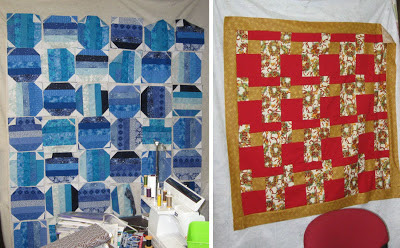 A snowball quilt using fabric strips, and another large print quilt were in progress on the design walls. WIPs (works in progress) in the Dizzy Divas classroom. 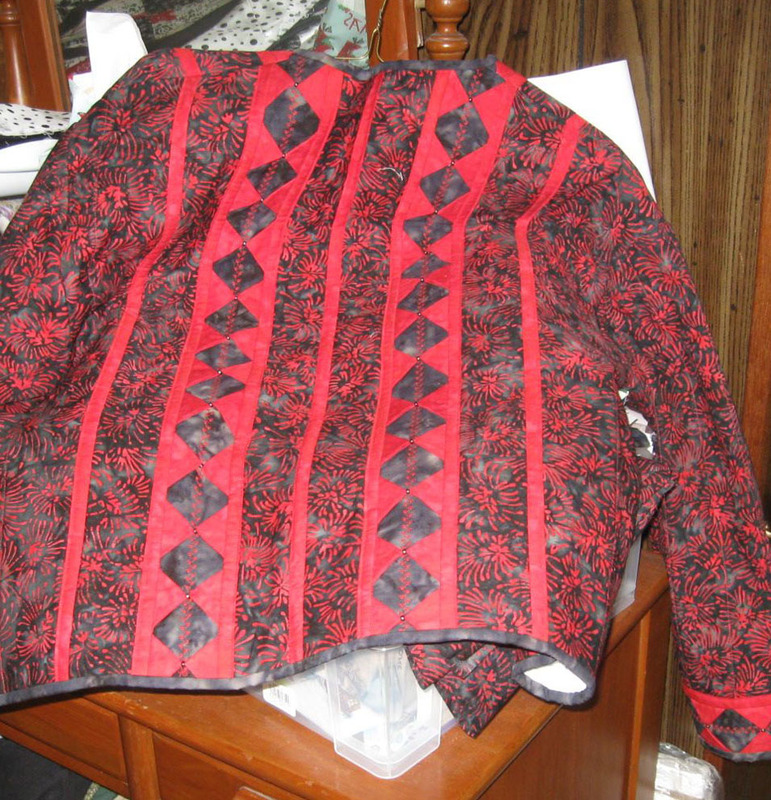 This quilted jacket—made for an upcoming class—was also in the classroom. A quilted jacket class sample. The shop's mascot is Princess, who showed me around and accompanied me into the classroom. I'd say she is the "doggie diva" of the store. 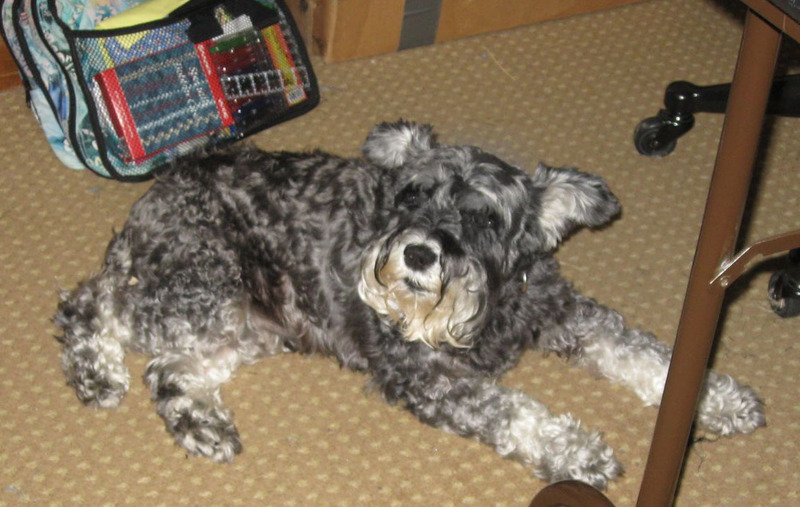 Princess is the shop mascot at Dizzy Divas. 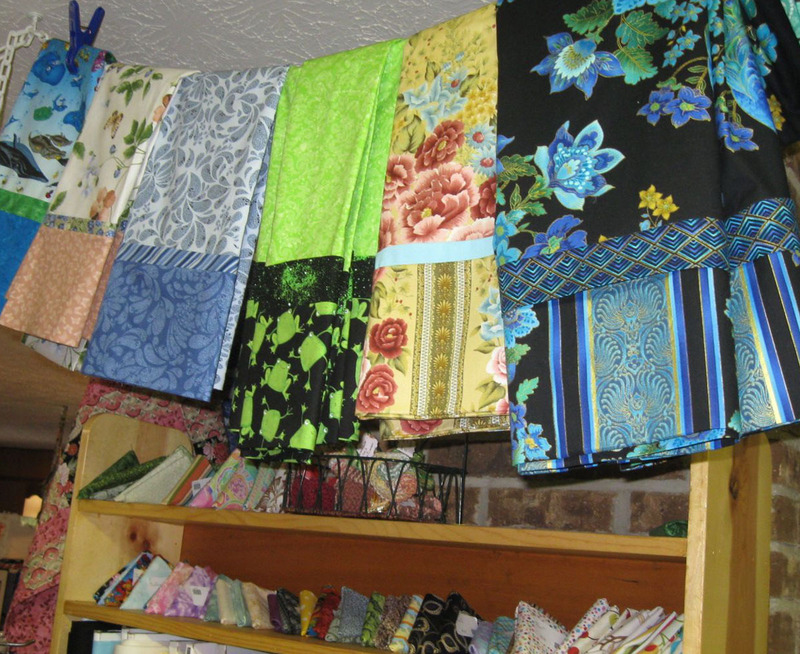 Pillowcases hang above shelves of Fat Quarters. 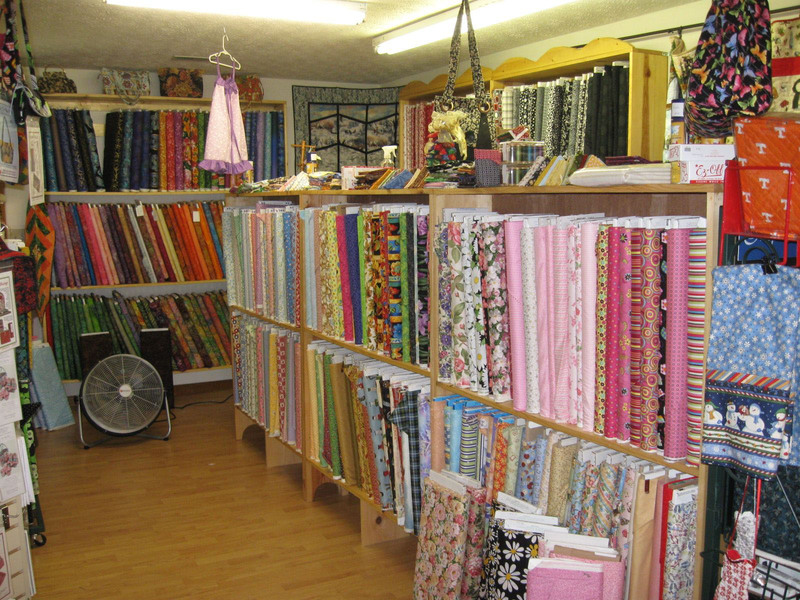 Dizzy Divas Fabric Shop is easy to get to from I-640. 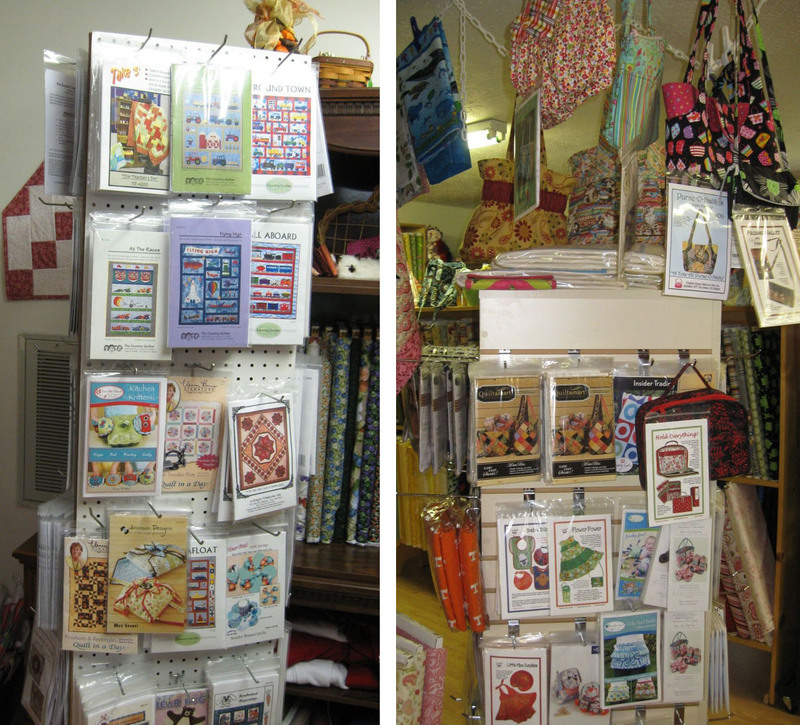 The shop is located across the street from a shopping plaza and next to the Dairy Queen. 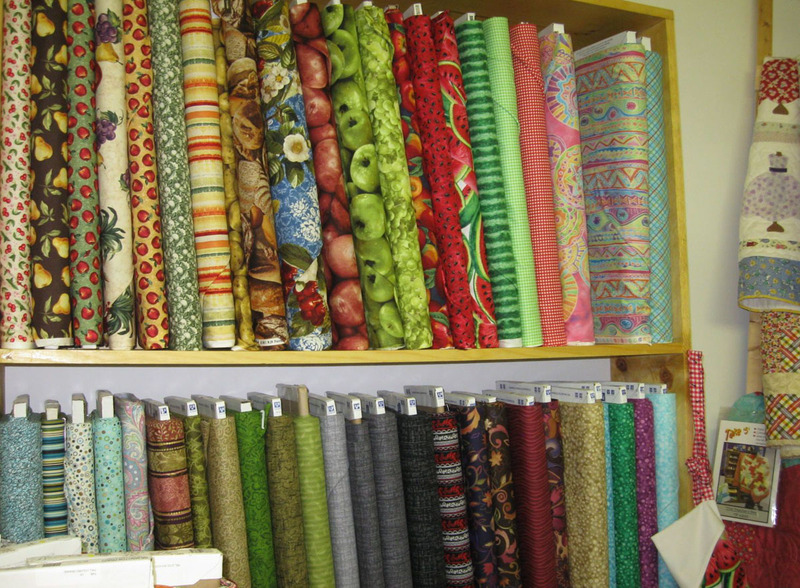 So to all you quilting and sewing divas and princesses (aren't we all?? ), the next time you are in the Knoxville area, pay a visit to Dizzy Divas for a much-deserved fabric fix. 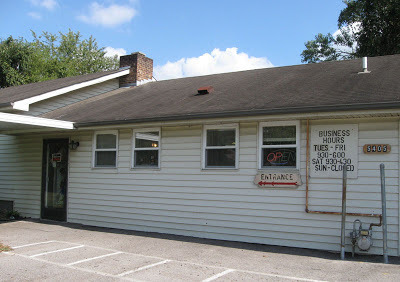 Then treat yourself to an ice cream at the Dairy Queen.